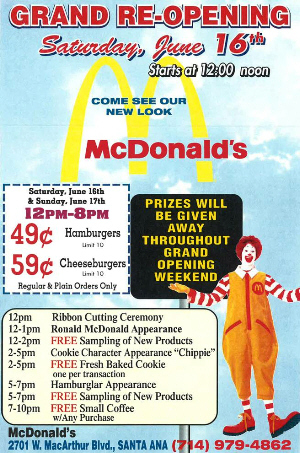 WHAT: On Saturday, June 16th Mangione and her staff will be celebrating the grand re-opening of their McDonald’s store in Santa Ana, beginning at 12pm. The Santa Ana location first opened on November 30, 1995 and was Mangione’s 9th store. WHO: Virginia Mangione is the owner-operator of Man-Cal, Inc. Her late husband, Sam Mangione, who established Man-Cal, Inc. (McDonald’s franchise chain) in 1967 would be very proud of the legacy he started over forty years ago which is still playing a vital role in the Orange County economy today. Virginia Mangione and her daughters, JoAnn and Samantha will be in attendance.